A Professor of Agronomy in the Department of Crop Physiology and Crop Production, College of Plant Science and Crop Production (COLPLANT) of the University, Professor Kehinde Okeleye, has expressed his support for government’s policy banning the importation of rice, stressing that the country does not have any business importing rice. According to the University Don, who is the immediate past Vice-Chancellor, Crescent University, Abeokuta, “I disagree with the assertion that the Federal Government was hasty to ban the importation of rice because if the Federal Government had not done this, the nation would not move on”. Professor Okeleye, who noted that it was high time the country moved out of its comfort zone of depending on importation to production, stated that it was the Federal Government’s policy that encouraged the collaboration between Lagos and Kebbi States, which brought about what is known as the ‘Lake Rice’. “Lagos has money but they do not have sufficient land. Kebbi has land, they may also have money but can channel it to other things and they collaborated to produce Lake Rice. What stops Ogun State with vast areas of lowland and good uplands in going into the massive growing of Ofada? What stops our University from being mobilised to produce? Other value chains associated with rice production alone can enhance youth employment and other entrepreneurial activities. With good funding and extension, I don’t think the nation has any business importing rice. That is my submission”. 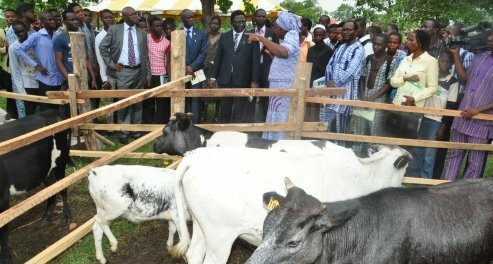 The Professor of Agronomy, whose research work centres on cropping system, food crops as primary interest, had worked in the areas of basic food security crops in Nigeria like maize, cowpea, cassava and rice, saying he had concentrated more on rice because of the challenging issues surrounding it. “Apart from cowpea and cassava, the nation spends a lot of money importing maize and rice. Only recently, it was said that the nation imported about N1.7 trillion worth of rice and one would wonder why it has to be so. So, my primary interest has been in solving some of the problems relating to the production of these crops. A fundamental problem facing these crops is that of low productivity on farmers’ fields. The yields at the farm level of these crops are very low. For example, the traditional maize produces less than one tonne per hectare but with improvement and good agronomy, we have varieties that can give up to three to four tonnes and there are even hybrids that can go beyond that yield level, and the same thing applies to rice”, he stated. “With rice, the traditional variety of rice can give an average of about one tonne per hectare and this usually affects the total output of rice in the country. We know that in those days, rice was not basic commodity but with our changing food habits and urbanisation, our taste has changed and rice is now more of a staple food and that change in status has compounded the issue of supply as local production can no longer meet supply and so, the short-fall has to be met through importation”, he added. Assuring that all hope was not lost for the country, Professor Okeleye stated that Nigeria can meet the short-fall in the production of rice if rice farmers would adapt the findings from his research. “From some of my own research, do you know that the basic yield of a normal rice variety that we cultivate has moved from one tonne in the upland to 2 to 2.5 tonnes per hectare? And of course, we have the lowlands and there are varieties that can give as much as 4 to 5 tonnes per hectare. You can imagine one tonne now moving to five tonnes as a result of improvement in varieties and production practices. There are even varieties that will do better now that rice improvement has gone into crossing breeding of top yielding Asian rice varieties with the indigenous West African rice, giving us interspecific rice hybrid called NERICA (New Rice for Africa), which has now been further improved into ARICA (Advanced Rice for Africa). With these improvements, you wonder what Nigeria is still doing with importation. We have no business importing rice”, he insisted. Speaking on other agronomic practices that he had been able to work on, the University Don said he had looked into the causes of poor yield, which he attributed to the soil, which are highly degraded and nutritionally-poor with low nitrogen in the soil. According to him, “the nutritional status of almost all of our soils is poor and that has been a major limitation to grain yield. Apart from the fertility level, pests and diseases are also major cause for concern, but with improvement in breeding, the issues of pests and diseases have more or less been controlled. There are now a lot of varieties that are pest tolerant and disease resistant. So, what we are now talking about in terms of agronomy is the improvement in nutrition. How do we sustain productivity? How do we use the land continuously with high yield so that the yield expectation can be sustained and we can do that over a number of years?”. Explaining further, Professor Okeleye stated that his research bordered more on how yields can be sustained. “We have tested the use of inorganic fertilizer, particularly for rice and discovered that rice tolerates as much as 90 kilograms of nitrogen per hectare, phosphorus 60 kilograms, potassium 60 kilograms and with these, we can get the yield level that we expect. But how do we use the land continuously even with the use of fertilizer because we cannot depend on that for too long because of the fragility of our soils, although we still have to work more with use of grain legume as sources of organic manure? But it is known that most farmers will not ordinarily plant any crop that will not give direct economic benefit. So, our research has come up with a development that the farmer first plants cowpea or soybean, then after harvesting the grains, they can incorporate the fodder and then put in their rice. These legumes have the ability of fixing atmospheric nitrogen and convert it into nitrates. With that, what is required as external input from inorganic fertilizer is reduced. With legume incorporation, you can use the land sustainably for as long as you can and with little dependence on inorganic fertilizer”, he stated. Professor Okeleye disclosed further that his research had explored land use intensification, whereby farmers could plant more than one season of rice in a year, adding that “we have worked on sustainable rice production in the uplands and have gone beyond growing a season of rice on a location in a year in the upland. Upland depends on natural rainfall. During that period, you can plant rice twice, which we call double-cropping. However, we developed a technology that is an improvement on that which we called ‘Arbuscular Mycorrhiza Fungus/Innoculation Rice Technology’. AMF, which is a micro-organism, which when innoculated into the soil, can assist the plant to tap more nutrients, especially phosphorus, can also trap moisture beyond the crop root rhizosphere (region) and make it available for the crop. So, with this, the rice can grow and produce during moisture-stress associated with late rains. With that technology, we have successfully planted double rice in the upland for close to three years now and they are doing very well. But in the lowland, we are looking at sustainably-producing rice in the lowland, because the lowland is an ecology that has moisture, almost throughout the year and with that, the farmer can tap from that. They can plant rice twice, then put in other crops and by the following year, another rice comes in and that can be done sustainably over a number of years without depreciating the soil resources because the lowland is fertile because of sedimentation of nutrients wash-off from the upland and all these are deposited at the lowland. So, the fertilizer need is not as heavy as what is needed in the upland. But then, these legume/rice rotations can also be practiced in the lowlands so that irrespective of the season, farmers can consciously use the land to sustain production. Professor Okeleye pointed out that a major limitation in the adoptation of the research knowledge is that of poor extension services. According to him, extension activities in the country are poor, as research breakthroughs that ought to be transferred to farmers, do not get to them adequately. The University Don said that through collaboration with Africa Rice Centre, Bouake, Cote d’Ivoire, two Ph.D students were funded on some extension work in the Northern Guinea Savanna and the Southern Guinea Savanna belts of Nigeria. But that was not enough to get the findings to farmers because the more the technology gets to the farmers, the more it can be practiced and the more people can be aware that these things can be done and thereby, reduce the cost of importation. Highlighting some challenges being faced during the course of his research activities, Professor Okeleye said they include the problem of funding and lack of equipment and field support facilities. He, however, said he did not allow such to deter him in his research activities, as he called on upcoming researchers to be focused and strive to contribute their quota into making Nigeria great.